New Server Opening Date Announced! The August 30th GSM has concluded, and we have some important announcements regarding the new (Gamma) server. 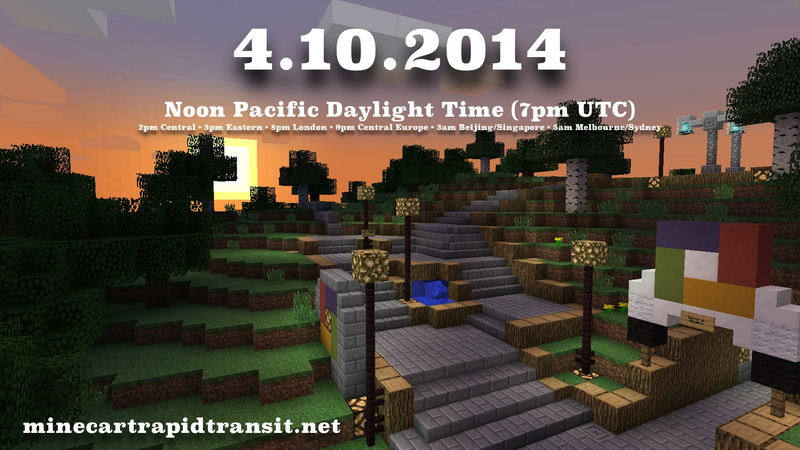 First, we have set the opening date for the new server for Saturday, October 4th! Here’s a desktop wallpaper if you want that (though the time is still subject to change). There will be another GSM held a week before launch on Saturday, September 27th. 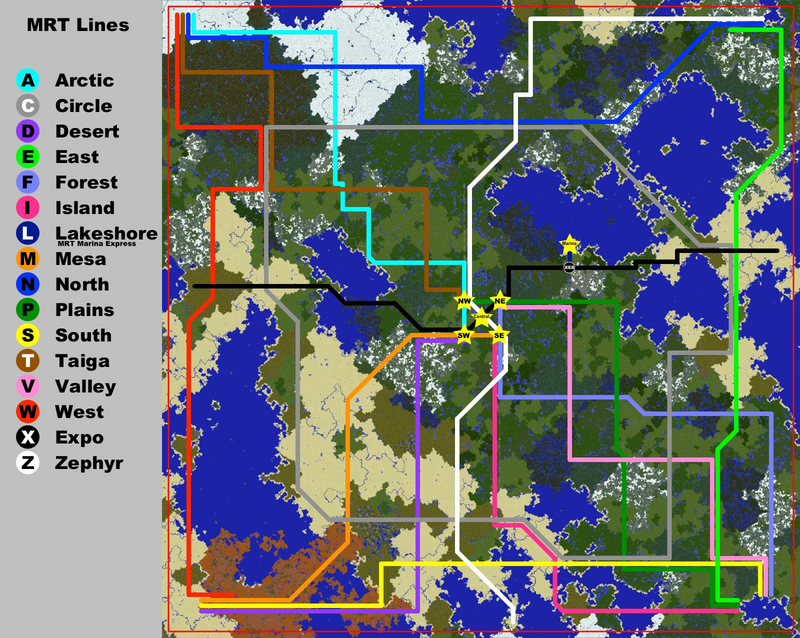 Second, you can now view a dynmap of the new server by navigating to http://dynmap.minecartrapidtransit.net. From here, you can watch the staff as they finish construction on Central City and the 11 initial MRT lines. All players will be given $0.05 per minute they are on the server and not AFK. All players are automatically set to AFK after 5 minutes of inactivity, and all non-staff players are kicked after 15 minutes of inactivity. Players will have access to personal /homes, private warps, and the /tpa command (same as /call). The difference between personal /homes and private warps is that /homes can only be used by yourself, while private warps can be shared with others, either as a command or as a warp sign. Players will be able to create warp signs for their own private warps, without the help of any staff member. Personal /homes will be free to use, but warps and /tpa will cost $0.25 per use. We’ll only be using the basic Essentials Economy functionality for now. We looked at various other plugins for companies, corporations, stock markets, shops, ticket booths, and turnstiles, but we decided to consider them at a later date. There will be a lottery plugin installed, which allows you to buy tickets for draws that take place every 12 hours. The uCars plugin will be installed on the new server, allowing players to place and drive minecarts on designated roads, like an automobile. It does not affect the functionality of regular minecarts on rails, except when a uCar drives on to a rail, the uCar attaches itself to the rail like a regular minecart. Any player can drive a uCar, but only members and up and place a uCar. This is to prevent guests from spamming uCars on roads. uCars require fuel to operate. You will be able buy fuel at designated gas stations with special [uFuel] Buy signs. Fuel costs $0.25 per litre, and 1 litre gives you about 2-3 minutes of driving time. What will happen to the old world? If you have any valuable items like books or maps that you want to keep, please place them in regular chests in the old world before the transfer. Don’t leave them in your inventory or enderchest, as they may get lost in the migration. 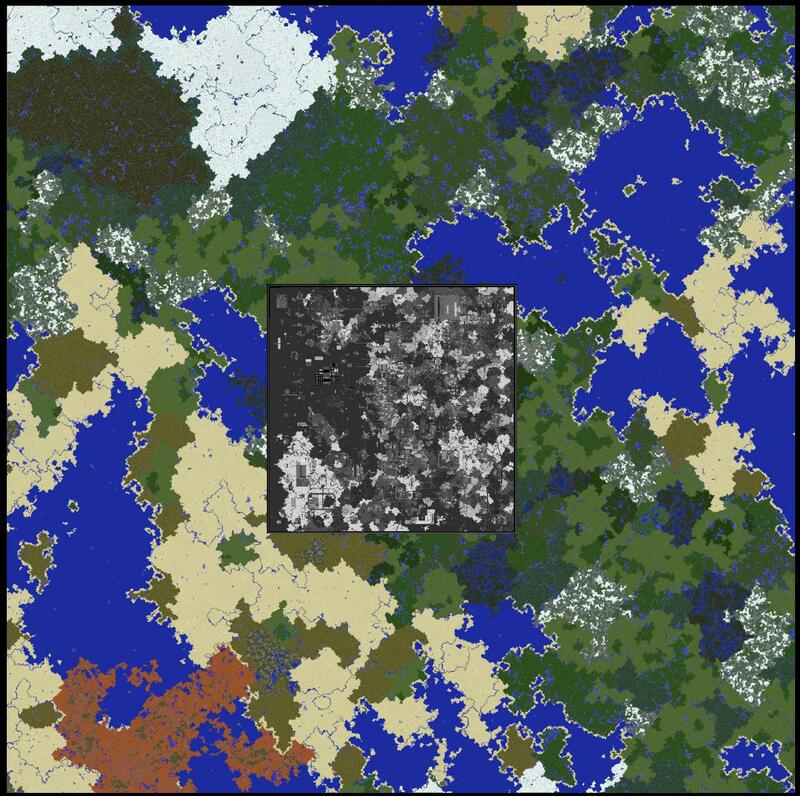 Custom map images may also break in the migration. If this occurs, we will be re-uploading these custom maps with new numbers, and you will then be able to replace the old maps with the new ones. All warps on the old world will no longer work after migration. Personal homes and warps will need to be recreated by the player. Please be patient as staff recreate the warps for warp booths, buses, and airplanes. We will not be copying large builds from the old world to the new world. You may ask a staff member to copy one or two small structures at the staff’s discretion, but we would rather encourage players to build new and original structures on the new world. The recording for the public portion of the GSM can be found here. The following players have been promoted to Trusted. Congratulations! The next General Staff Meeting will be held this Saturday, August 30th at 10pm GMT. The staff-only portion will start as usual an hour earlier at 9pm GMT. At this meeting, expect some major announcements regarding the new server, and that may include a possible launch date. Moderator and Trusted nominations are now open at dft.ba/-MRTNominate. Please note that this will be the last opportunity for you to make these nominations before the upcoming launch of the new server, so please send in your nominations now. Hey guys! We’ve been super busy building the MRT network on the new world and streaming it over the last week, so here’s some updates of what you can expect in the MRT system when the new world opens soon! I’ve drawn up an updated map of the system as we currently have it planned. The current map - click for full size. The black line has been renamed to “Expo” and re-lettered to “X”. The white line has been renamed to “Zephyr” and re-lettered to “Z”. The pink line has been renamed to “Valley” and re-lettered to “V”. The green line has been renamed to “Plains” and re-lettered to “P”. A new line has been added. Known as the L-Lakeshore line or MRT Marina Express, it’s a two-stop shuttle from the eastern Expo line to the main marina. Transfer to the Lakeshore line will be available at XE8-L1 station. It’s hard to see in the map, so click on it to see the full version and zoom in near the MRT Marina star. The Arctic Line has been extended from Central NW to Central SW. 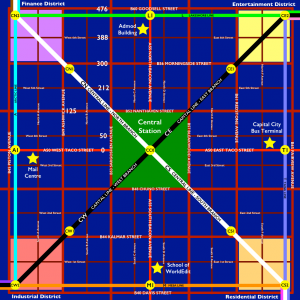 The Mesa Line has been extended from Central SW to Central SE. The Forest Line has been extended from Central SE to Central NE. The Plains Line has been extended from Central NE to Central NW. Be sure to check out our streams on Twitch, there’s a lot going on there! The new world is now under construction! Staff are beginning to get MRT lines and stations installed, and Central City is starting to take shape. If you want to get a sneak peek at the new world, check out some of the staff members’ streams! We’re streaming our construction over on Twitch, so be sure to check us out. Most of us have our Twitch names the same as Minecraft. Click on the links below to go to our streams! Everyone at once: click this link to see all of the streams at once! I will add more links as soon as I find the other staff on Twitch. If you see them, let me know. See you on the streams! Frumple’s Update: The recording for the public portion and Q&A of the GSM is now available here. Please note that we have decided to not promote any members to the Trusted rank at this meeting. Chief’s Update: I punched a wall during the private staff meeting. A recording of that is available here. 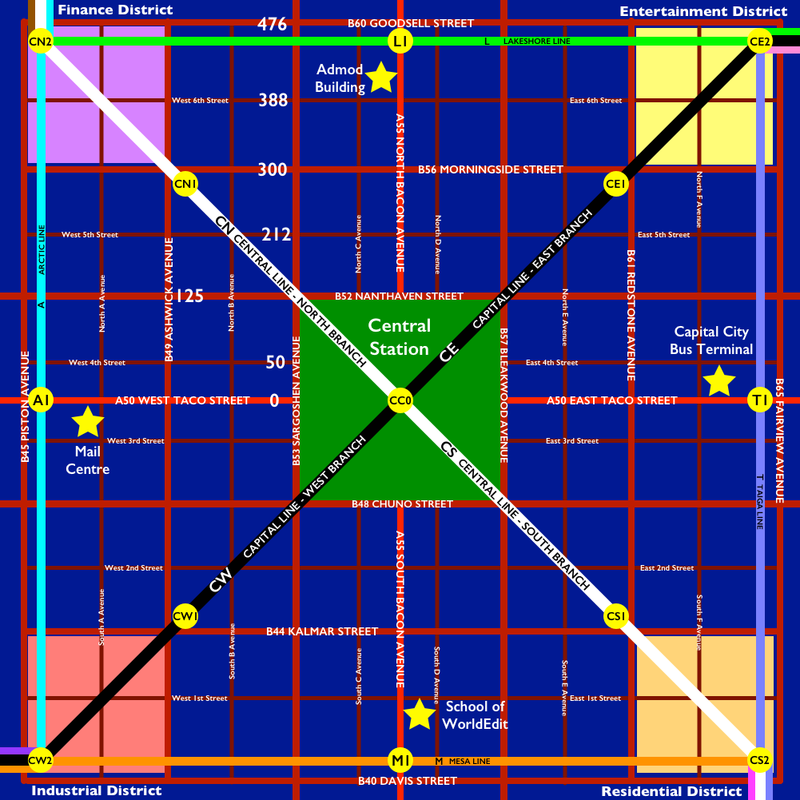 Here are some of the maps we’re going to be using to build the initial MRT lines and Central City. Of course, things might change slightly before the server opens. Please continue, as always, to send us feedback. More GSM results will be posted shortly!